The Migraine Mafia is a funny, well-written book about Viive, a hard-working go-getter who suffers from migraines. I could not only relate to Viive, as I have suffered migraines myself, but I could see myself being friends with her. Viive’s illness is woven effortlessly into the story as she takes on a very strong-willed and straightforward mother and a sister-in-law deserving of the “Most Annoying” trophy. The relationship the main character has with her caring and dedicated husband is so charming, but not without some flaws, which makes it relatable. Sepp’s depiction of office life is spot on, with crazy and memorable co-workers, lack of the elusive work-life balance and forced vacation, which is anything but. Throw in a support group and some drugs and you’ve got a great book! No Advil required! 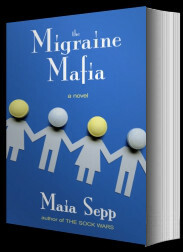 The Migraine Mafia by Maia Sepp is available on Amazon, Kobo, iBookstore and Barnes & Noble.